ChildCareDirectory.net.au is published by FUMAPEST to provide contact details for child care, family care and vacation care centres • website links to government and industry organisations • click here to apply for a FREE listing. Disclaimer & Feedback • information contained in ChildCareDirectory.net.au may be inaccurate and need updating • we welcome your comments, suggestions for improvement or details of incorrect entries • please click here to email us. FUMAPEST Penrith Pest Control for professional pest control programs to schools and child care centres in Penrith Council area • phone FUMAPEST 1300 241 500. FUMAPEST Pest Control Penrith • professional pest controllers Penrith Council region • rats • fleas cockroaches • ants • spiders • mice • bed bugs • bee swarms • wasps • termites • termite baits • termite inspection reports • termite barriers. Australian Children's Education & Care Quality Authority • the national entity overseeing important changes to early childhood education and care and school age care. On 1 January 2012, the National Quality Framework for Early Childhood Education and Care began. It is being introduced across Australia to help early childhood education and care sector, governments and the community to improve the quality of services. The Department regulates the operation of early childhood education and care services for children from birth through to and including school age. It also provides some funding to education and care services. NSW Food Authority • Contact address map details phone fax email • Food Act NSW • Food Regulations • Food Standards • Food Safety Notifications. Local Council Enforcement • Complaints about Food Businesses • Food Safety • Keeping Food Safe • Cooking Correctly • Prevent Food Poisoning. Click here to review recent media reports on restaurants and cafes fined and listed on the NSW Food Authority name & shame website. Linked search of the Register of the NSW Architects Registration Board - click here. Find NSW Govt DFT Licensed Home Builders in Penrith Council region. Penrith Council TPO Tree Preservation Orders • Penrith Council Application Forms • Tree Removal • Tree Lopping • Tree Pruning • Stump Grinding & Removal. Find Vets • Veterinary Hospitals • Veterinary Surgeons • Veterinary Clinics in the Penrith Council region. Search the Register of NSW Veterinary Practitioners Board - Vets & Veterinary Hospitals. Find a Pet Owners Guide to Veterinary Care & Medicines used in Pet Care. 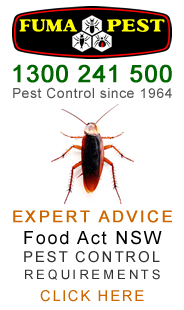 FUMAPEST Penrith Pest Control 1300 241 500 for safe effective pest control of cockroaches • ants • bed bugs • fleas • rats • mice • spiders • bees • wasps • silverfish • bird proofing • termite inspection reports • termite control • termite barriers • termite baiting. A FUMAPEST Termite Inspection Report & Treatment Proposal costs $250 for average size home • comprehensive inspection and report • termite control options to AS 3660.